What Are the Dangers of Putting Vinegar on Your Hair ? In an age when it seems like there are unpronounceable chemical ingredients in everything, many people have become interested in making their own natural hair-care products. When magazines like "Good Housekeeping" recommend using inexpensive apple cider vinegar to make clarifying rinse, there doesn't seem to be any reason not to try it. However, if you have certain health conditions or even a certain type of hair, using vinegar on your head can be dangerous. One danger of putting vinegar on your hair is an allergic reaction. Though vinegar is not one of the eight major allergens responsible for most allergic reactions, your body can develop an allergy to anything. Don't use vinegar on your hair if you've ever had an allergic reaction to any food with vinegar in it. Even if you haven't had a reaction to vinegar, you can develop an allergy without warning. Seek emergency medical help if you break out in a rash or have trouble breathing. Another danger of putting vinegar on your hair is the possibility of a sulfite reaction. Sufites are naturally occurring chemical compounds present in vinegar and other tart foods. Manufacturers also add sulfites to food to extend shelf-life. If you have asthma and are on a steroid-based medication, or if you have a high degree of respiratory sensitivity, you may have an adverse reaction to the sulfites in vinegar. People older than 50 also have an increased risk for sulfite reactions, according to the University of Florida. Putting vinegar on your hair can cause skin irritation, especially on your scalp. There are a lot of blood vessels and nerves in the surface of the human head, and scalp skin tends to be sensitive. Though this might not be a problem if your skin is healthy and intact, if you have acne or any cuts or scrapes on your head, the acid in the vinegar will cause pain. Use special caution if you've been to the beach or any other sandy area; you may have scratches on your head you can't feel. A final -- though less serious -- danger of putting vinegar on your hair is hair damage. Vinegar is a drying agent, which is why MayoClinic.com recommends using a mix of vinegar and water to prevent swimmer's ear. If your hair is naturally dry, has been colored or tends to be brittle, vinegar may dry it out and make breakage more likely. 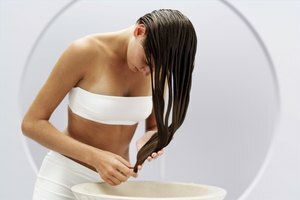 Thin, fine hair may also react badly to a vinegar rinse. If you insist on using one, dilute the vinegar and rinse it out right away.